Pros: Great sound, lots of compatibility, good power, small footprint. Disclaimer: I did not purchase the Cozoy Astrapi but I will not let review bias effect me and will not hold any punches when there are punches to be throw. Now let’s begin! The Cozoy Astrapi is one of those devices that blows your mind away when you see it in real life. It is so comically small that you have to hold it in your hand before your mind can process how small it truly is. Looking at photos just does not shoot that message across at all. I know, because it happened to me. 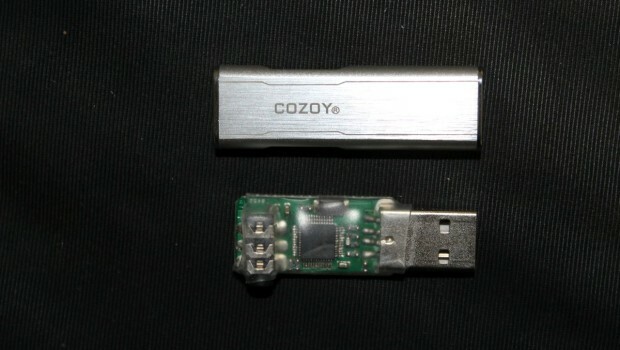 COZOY is a digital-to-analog converter and amplifier that provide significantly improved headphone sound quality for audio players, tablets, and portable devices. 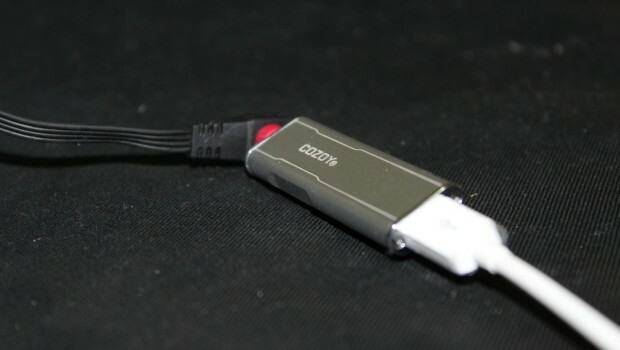 COZOY take the digital audio data stream from your preferred audio device and process and amplify it making your favorite headphones sound their best. The Astrapi is all-aluminum build and modern design. 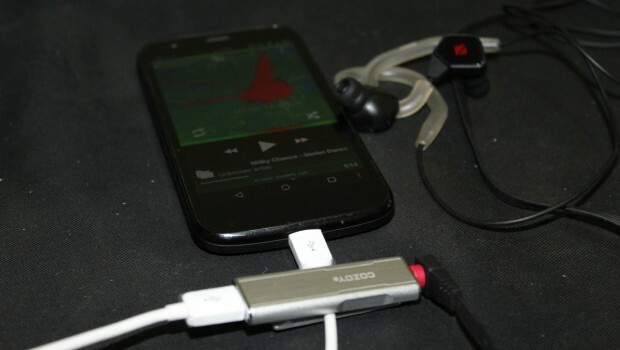 COZOY was designed for audio players, tablets and other portable devices running operating systems such as; Android, iOS and PC. 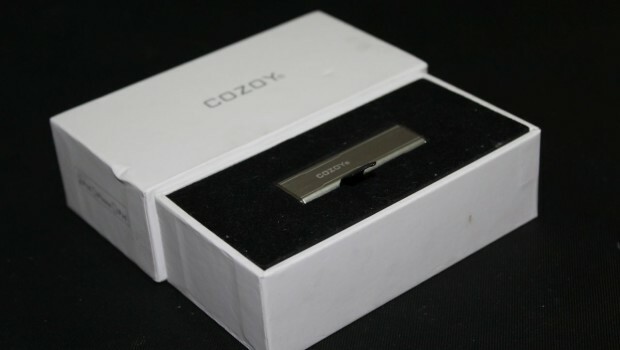 COZOY incorporates proprietary digital Sound processing and conversion along with a high-performance headphone amplifier, all within an extremely portable form factor. 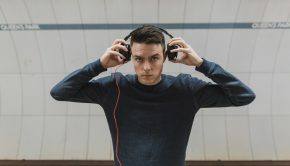 COZOY is designed for those who use their phones, tablets, laptops and other portable devices as their primary listening and viewing platforms and who seek the best-possible headphone or in ear listening experience for music, video, and gaming by providing improved resolution, spatiality, dynamics, and heightened realism. COZOY’s extremely low power consumption allows for extended playing time and with its plug-and-play connectivity, eliminates any complex setups. 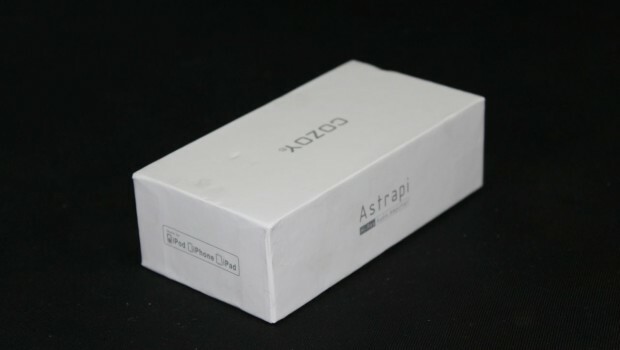 The Cozoy Astrapi comes in a very suspiciously Apple looking box. It’s white with very subtle silver/grey writing. There is a print on every side of the box. It’s not inviting or too busy. This is the kind of packaging I would’ve just walked past and not look twice. Some people look for different things, though. On the bottom of the box there is a “General Guidelines” or basically all the instructions you’d ever need, including the specifications and packing list. A very nice addition is the assembly drawing, or exploded diagram, however you prefer to call it. Shows you exactly what goes into making one of these units. Inside the box is the Astrapi sitting nice and snug inside a felt covered foam block with a nice pull tab that is an awesome idea. 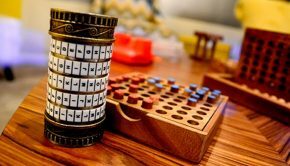 The Astrapi is so small that you would have trouble taking it out with just your fingers. This idea was brilliant. Underneath you get a Warranty card and you accessories are all located in the bottom compartment. The Cozoy Astrapi is a very nice looking unit. Beautifully lazer etched lines on the machined aluminium casing, that is pin stripe finished. Indents on both side for easy grip of the unit while plug and unplugging. It is super elegant and practical. On the back is has a very nice, low profile shirt clip which feels tight and heavy duty. But those look kind of flimsy. I have use the shirt clip to pin the unit to the cable so it doesn’t dangle around. It works well and holds on very strongly. I had a few compatibility issue with this particular unit. With everything I tried. Doesn’t work as a plug and play device. To get it to work you must plug it in and restart the phone. 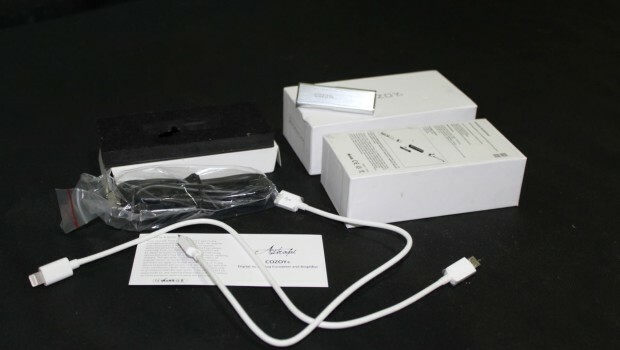 After the phone reboots, the Astrapi is then used as the permanent sound device for you phone. You cannot make calls as the microphone does not work. But it does work for all your music and works quite well indeed. It is definitely an upgrade over the stock sound hardware in both these devices. This works perfectly as a plug and play device. Plug it in and off you go. Only issue that there really is is that when the PC comes out of sleep or restarts the Astrapi is not recognised as a plugged in device. You must unplug it and plug it back in for it to be recognised again. A small quirk, but it’s a minor issue. The sound is smooth and transparent, maybe a little warm. 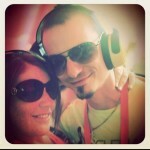 Separation, sound stage and imaging is above par I would say. It paired very well with everything I threw at it, especially IEMs. I didn’t hear any EMI coming from the PC ground or any low level hissing at all. Sound changes slightly depending on the source that is driving it. Higher current interfaces have better results. Eg. 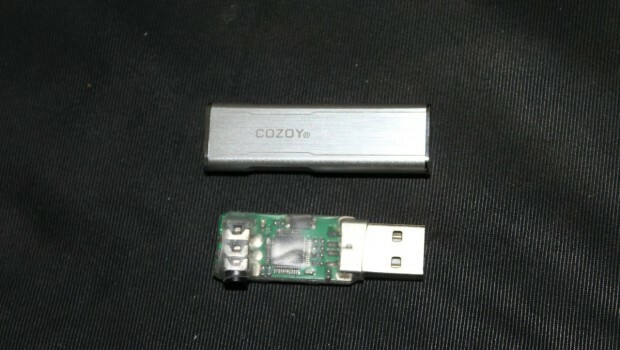 a 1A powered USB device/hub. It does fall short in power with full sized cans, but nothing major. When using things that have around 60 Ohms, the volume control does little from 50% – 100%. Volume wise it is loud enough, but it is not authoritative. The UD110 is a very capable little device. But put up against the Astrapi as a DAC/amp on it’s own, it go it’s ***** handed to it. The Astrapi is not only a better looking and better built device. 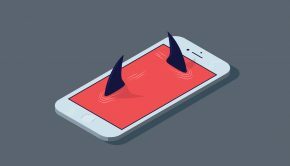 It (supposedly, haven’t tried) works with Apple devices and Android devices. UD100 only works with Android and PC. The UD110 has something like 440 Ohms of output impedance, which is OK for a DAC coupled with a separate amplifier but as a standalone unit it’s pretty bad. The Astrapi sounds smooth and fuller than the UD110. The only thing that the UD110 has that the Astrapi doesn’t is that it is about half the price and it plays a wide range of high resolution playback. Which quite useless when looking at the market it is targeting. 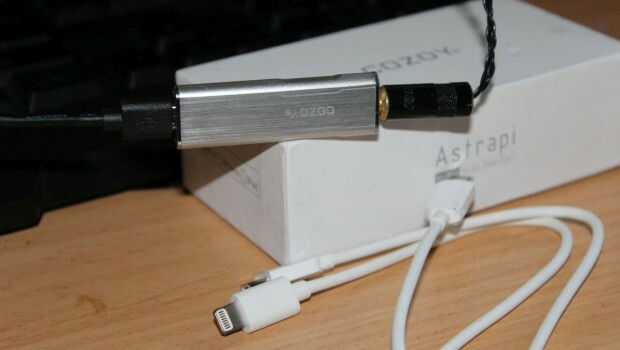 The Cozoy Astrapi is probably the most perfect looking portable DAC/amp I’ve ever seen. The small footprint and beautiful design makes it leagues better than the rest in practicality for easy to drive IEMs and headphones. 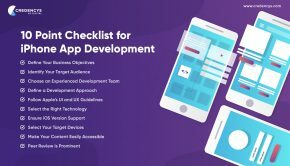 Of course there are small quirks to work with, but that can possibly be ironed out with future updates. Igor Rebenko A draftsman by trade and a family man. I am a long admirer of technology and progress of all kind.